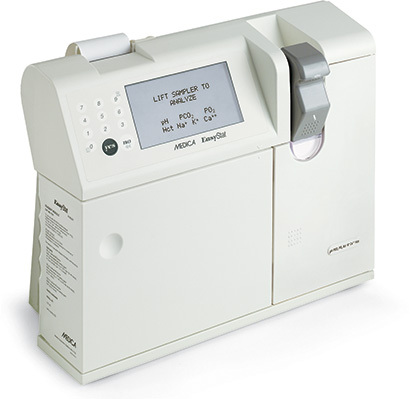 Medica’s EasyStat® blood gas analyzer delivers the precision and performance required of today’s demanding health care environment, while focusing on the laboratory’s need to deliver sample results economically and efficiently. The EasyStat analyzer measures pH, PCO2, PO2, Na+, K+, Ca++, Cl–, and Hct and calculates additional parameters. Patient parameters, including FIO2, patient ID, patient temperature, %FIO2 drawing site, and other information can be entered using the digital keypad and integrated with patient results. Liquid calibrants are packaged in a single convenient reagent module. All analyzer components are combined into simple modules that are easily accessible to the user. In addition, simple menus guide the user through analyzer operation. EasyStat’s compact format and modular design significantly reduces maintenance and space requirements. Disposable electrodes and reagent module ensure economical operation and low cost per sample.